The Confederate States of America (CSA), also known as the Confederacy, was a government set up in 1861 by seven southern slave states (South Carolina, Mississippi, Florida, Alabama, Georgia, Louisiana, Texas, Arkansas, North Carolina, Virginia and Tennessee) that had declared their secession from the United States. The Confederacy recognized as members eleven states that had formally declared secession, two additional states with less formal declarations, and one new territory. Secessionists argued that the United States Constitution was a compact that each state could abandon without consultation; the United States (the Union) rejected secession as illegal. The American Civil War began with the 1861 Confederate attack upon Fort Sumter, a Union fort within territory claimed by the CSA. By 1865, after very heavy fighting, largely on Confederate soil, CSA forces were defeated and the Confederacy collapsed. No foreign nation officially recognized the Confederacy as an independent country, but several had granted belligerent status. 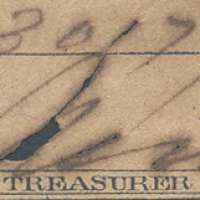 Both the individual Confederate states and later the Confederate government printed Confederate States of America dollars as paper currency in various denominations, much of it signed by the Treasurer Edward C. Elmore. During the course of the war these severely depreciated and eventually became worthless. Many bills still exist, although in recent years copies have proliferated. The Confederate government initially wanted to finance its war mostly through tariffs on imports, export taxes, and voluntary donations of gold. However, after the spontaneous imposition of an embargo on cotton sales to Europe in 1861, these sources of revenue dried up and the Confederacy increasingly turned to issuing debt and printing money to pay for war expenses. The Confederate States politicians were worried about angering the general population with hard taxes. A tax increase might disillusion many Southerners, so the Confederacy resorted to printing more money. As a result inflation increased and remained a problem for the southern states throughout the rest of the war. At the time of their secession, the states (and later the Confederate government) took over the national mints in their territories: the Charlotte Mint in North Carolina, the Dahlonega Mint in Georgia, and the New Orleans Mint in Louisiana. During 1861, the first two produced small amounts of gold coinage, the latter half dollars. Since the mints used the current dies on hand, these issues remain indistinguishable from those minted by the Union. However, in New Orleans the Confederacy did use its own reverse design to strike four half dollars. Since these have a small die break on the obverse, which is also seen on some of the regular 1861-O coins, it is possible that these were minted under CSA authority. The Confederate dollar, often called a "Greyback", was first issued into circulation in April 1861, when the Confederacy was only two months old, and on the eve of the outbreak of the Civil War. 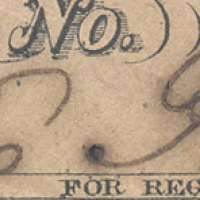 At first, Confederate currency was accepted throughout the South as a medium of exchange with high purchasing power. As the war progressed, however, confidence in the ultimate success waned, the amount of paper money increased, and their dates of redemption were extended further into the future. 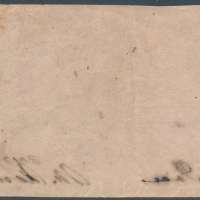 Most Confederate currency carried the phrase across the top of the bill: "TWO YEARS AFTER THE RATIFICATION OF A TREATY OF PEACE BETWEEN THE CONFEDERATE STATES AND THE UNITED STATES OF AMERICA" then across the middle, the "CONFEDERATE STATES OF AMERICA will pay" [the amount of the bill] "to BEARER." As the war progressed, the currency underwent the depreciation and soaring prices characteristic of inflation. For example, by the end of the war, a cake of soap could sell for as much as $50 and an ordinary suit of clothes was $2,700. Near the end of the war, the currency became practically worthless as a medium of exchange. This was because Confederate currency were bills of credit, as in the Revolutionary War, not secured or backed by any assets. Just as the currency issued by the Continental Congress was deemed worthless (witness the phrase "not worth a Continental;" and see The Federalist Papers, which also addressed this issue in the run-up to the ratification of the U.S. Constitution) because they were not backed by any hard assets, so, too, this became the case with Confederate currency. 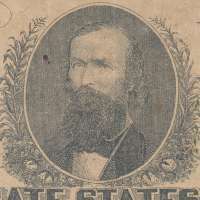 Even though both gold and silver may have been scarce, some economic historians have suggested that the currency would have retained a relatively material degree of value, and for a longer period of time, had it been backed by hard goods the Confederacy did have, perhaps such as cotton, or tobacco. When the Confederacy ceased to exist as a political entity at the end of the war, the money lost all value as fiat currency. Serial number written in black ink. RECEIVABLE IN PAYMENT OF ALL DUES EXCEPT EXPORT DUTIES.